Alembic itself is composed of several layers of libraries, each of which builds extensively on the layer below it. 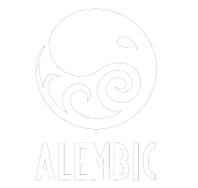 Because Alembic is intended as a caching system, and not a live scenegraph, the API is split into two roughly symmetrical halves: one for writing, and one for reading. At the Abc and AbcGeom layers, classes that start with ‘O’ are for writing (or “output”), and classes that start with ‘I’ are for reading (or “input”). This is analogous to the C++ iostreams conceptual separation of istreams and ostreams.